The Organizing Committee of the Boeing Classic Indoor Track & Field Championships is proud of the quality and history of this longstanding meet, and the contributions it has made to the sport of track and field in Manitoba. The Boeing Classic Indoor Track & Field Championships was first staged in a hanger in Gimli in 1981. After two years of competition in Gimli, the meet was held in the Minto Armories (with a portable track) before moving into the present Max Bell Center. Winnipeg Optimists Athletics (WOA), formerly Assiniboia Optimist Track Club (AOTC) has hosted this meet for the past 35 years and Provincial Indoor Age Class Championships, while Boeing Canada Technology has been the corporate sponsor. The Boeing Classic Indoor Track & Field Championships also serves as the 2019 Manitoba Indoor Age Class Championships. This year’s commitee hopes this event serves as a successful competition for our local, and visiting out of province athletes. The Boeing Classic Indoor Track & Field Championships will run the Elementary School Relays on Feb 28 and the Manitoba Indoor Age Class Championships on March 1 and March 2 at the Max Bell Centre. The Indoor Classic is one of the largest indoor meets on the prairie indoor circuit. Over 300 officials and volunteers are required to stage the 3 day event. 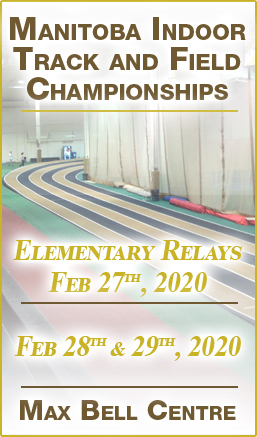 Over 1000 elementary athletes will compete in the Elementary Relays and approximately 1000 athletes will compete for their school or club in the age class section. More than 800 gold, silver, bronze Boeing medals are awarded to the athletes each year. The mission of Winnipeg Optimist Athletics, through its coaches, Parent Executive and partners, is to support athletes excellence and to provide opportunities for Manitobans to experience the challenges of athletic development. In 1979, former athletes Larry Switzer, Greg Hershman and Wayne McMahon, along with Jack Parrington, formed Assiniboia Optimist Track Club (AOTC) with support from the Assiniboia Optimists. Winnipeg and Manitoba needed a track and field club with highly qualified coaches, who were available year-round. AOTC offered the opportunity for personalized coaching and more competitions. With funding from Boeing Canada, Larry, Wayne and Greg organized and ran the first Boeing Indoor Track Meet in 1981 in Gimli. In 1995, the club name was changed to Winnipeg Optimist Athletics (WOA) to better reflect the wider-based support of our founding partner.